For courses in nursing theory. 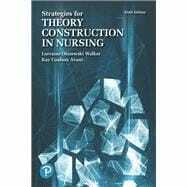 Strategies for Theory Construction in Nursing provides a straightforward, logically organized resource on theory development, from a nursing perspective. It places theory development in the context of both a rich history tracing back to the mid-¿20th century and of contemporary and emerging issues. Present¿-day coverage includes population- and domain-specific theories addressing the needs of diverse clients. Reflecting vast changes in nursing practice, the 7th edition covers advances both in theory development and in strategies for concept, statement, and theory development. It also builds further connections between nursing theory and evidence-based practice. Lorraine O. Walker, RN, EdD, MPH, FAAN, has had a lifelong interest in nursing knowledge development and maternal and infant health. She received a BSN from the University of Dayton, as well as a master’s degree in nursing education with a specialization in maternity nursing, and a doctoral degree in philosophy of education from Indiana University-Bloomington. She also received an MPH degree in maternal-child health from the University of Alabama at Birmingham, and completed post-doctoral studies in educational psychology at The University of Texas at Austin. She currently holds the Luci B. Johnson Centennial Professorship in Nursing. Her teaching includes global health; quantitative design and analytic methods; and theoretical and philosophical aspects of nursing. Her research focuses on health promotion of childbearing-aged women and infants. Dr. Walker was honored in 2017 by induction into the Sigma Theta Tau International Nurse Researcher Hall of Fame. Kay C. Avant, PhD, RN, FNI, FAAN, retired as Professor Emeritus in 2016. She has also had a lifelong interest in nursing knowledge development and maternal-infant health. She received her diploma in nursing from Methodist Hospital, Dallas; her BSN from Texas Christian University; her MSN from the University of North Carolina-Chapel Hill; and her PhD from Texas Woman’s University. She completed post-doctoral work in community and school health nursing at the Royal Melbourne Institute of Technology in Australia. Her teaching included philosophy of science, theoretical development of nursing, and informatics. Her research interests are primarily in standardized language development, and global health of women and children. 1. Theory in Nursing: Where Have We Been? Where Are We Going?